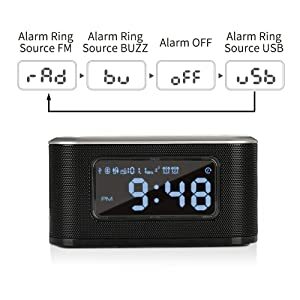 【FM Radios & Programmable Sleep Timer】FM frequency range is 87.5MHz-108MHz. With 20 station storage, store any of your favorite stations for easy and quick listening. 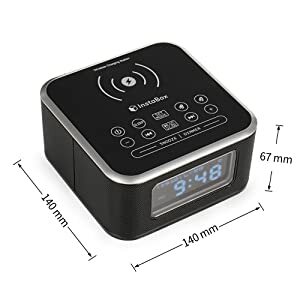 Fall asleep to the radio using the programmable countdown sleep timer. 0-90 minutes optional. InstaBox provides ONE YEAR warranty and 60 days no-reason return of the product. 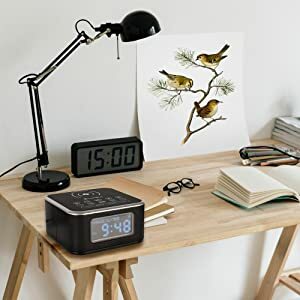 At first glance, you may underestimate the quality of such a Compact Wireless charging Alarm Clock Radio with Bluetooth Dual Speakers. 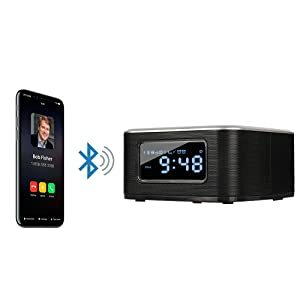 The true appeal of InstaBox W33 lies in its ability to deliver elegant digital Alarm Clock,12 or 24hr switch, snooze option, drop and charge, FM radios & programmable sleep timer, enjoy all your favorite music. 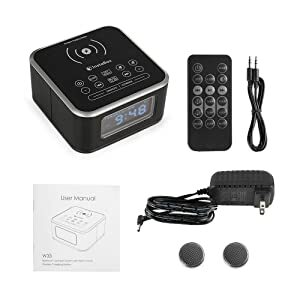 It' s portability and multi-function design makes it the perfect audio companion for indoor. Snooze functions afford you a few extra minutes of sleep. Use InstaBox W33 as an alarm clock instead of the smart phone to reduce radiation! 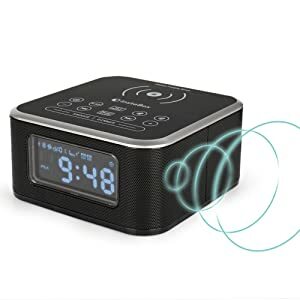 Add your favorite station/channel/song as the alarm ringtone, begins with a subtle, low volume that gradually increases to a higher volume to gently wake you up. Snooze functions afford you a few extra minutes of sleep. Use W33 as an alarm clock instead of the smart phone to reduce radiation! On the top side, there's a 5W 1A wireless charging station for mobile phone or other devices owning wireless charging function. 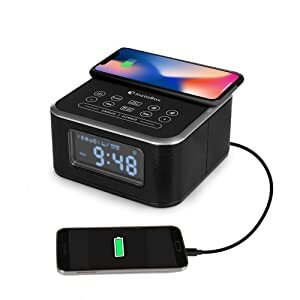 Compatible with iPhone X/iPhone 8 Plus/iPhone 8/Samsung Galaxy S8/S7/S7 edge/S6 etc. Besides, built-in a USB charging port on the back of the device for charging any USB devices via cable. 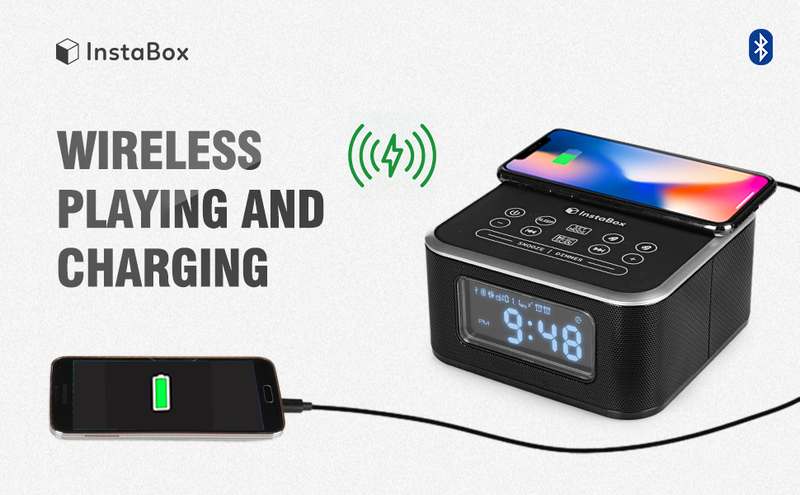 InstaBox W33 is equipped with Bluetooth capability that can pair to your tablet, phone, or other device and also features a 3.5mm jack to connect tablet, mp3, mp4 or other non-Bluetooth devices. Enjoy all your favorite music. Press and release the "TIME" button to enter setting up clock time, then press+ or - to switch 12/24 hours, press"TIME" button again to confirm and then press + or - to adjust the HOUR, then press"TIME" to confirm and then press + or - to adjust the MINUTE and press the "TIME" button to save. It exits the setting in 10 seconds if no operation on any key. 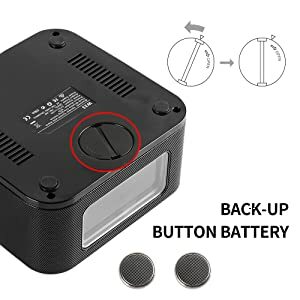 2 pcs button battery is included in the package, assemble it into the unit for time back-up. An optional backup battery keeps the clock working during a power outage. Plug the power adaptor into DC jack on the back (NOT AUX), Power on, LCD displaying on. Press the SET/MODE button again and the alarm is set. It will exit the setting in 5 seconds if no operation on any key. 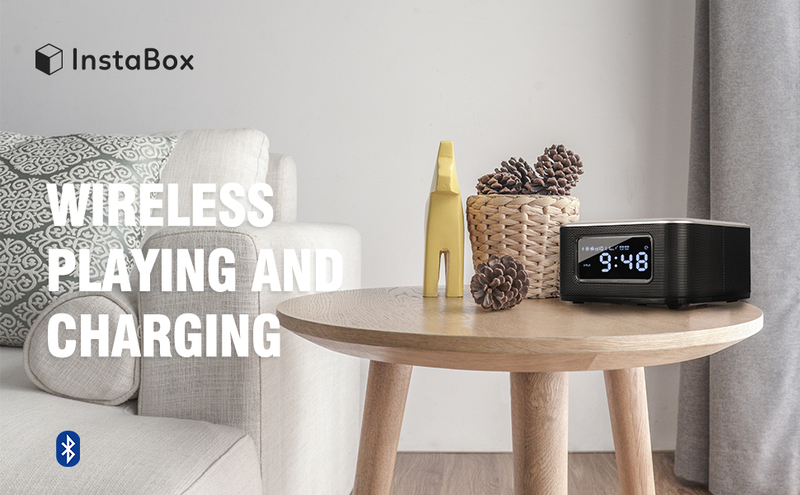 Snooze mode allows you to sleep extra minutes after it rings. 9 minutes interval to mute the sound for every click button, which can be repeated to one hour until turned off. You can press prower/alarm button to cancel alarm. Or switch alarm to OFF mode. Equipped with radio antenna for local FM radio stations, it provides clear and great reception to maintain a good FM listening. Press and hold the "scan" button to the auto radio station and store the scanned stations accordingly. FM radio function scans from 87.5-108MHz, you can store up to 20 your favorite stations. 3 Inches large LCD screen with eye easy catch the number display, time and content are easy to read at a glance. 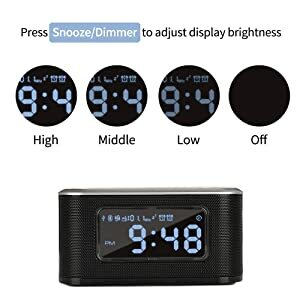 4 level (high/middle/low/off ) adjustable display brightness for comfortable viewing during day and night. And you can make it dim at night and fall asleep comfortable.